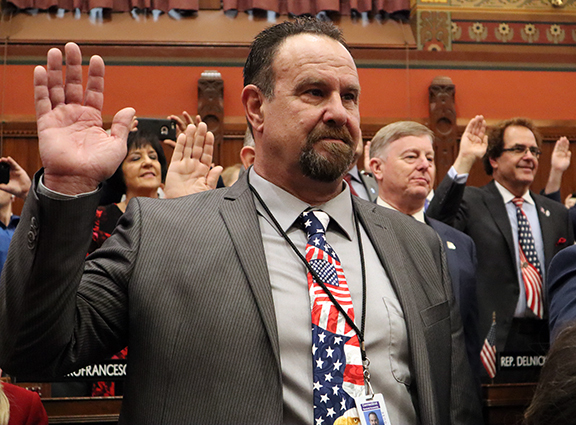 Hayes who is entering into his first-term, has received his two-year committee assignments by House Republican Leader Rep. Themis Klarides who selected him to serve on the General Assembly’s Environment, Children’s, and Public Safety Committees. Prior to the November elections, Hayes spent 33 years working in law enforcement, is excited to transfer the knowledge and experience he’s gained as an officer and Putnam Chief of Police to the new responsibilities he will have as a member of these committees. “I am excited about all three of my committee appointments and eager to get started. Public Safety is in my blood. My career in law enforcement has always included the safety and matters related to children, so I think this this appointment is also a natural fit. I also have a love for nature and am a strong supporter of our local farmers and agriculture, so I’m also very pleased with being appointed to Environment,” Rep. Hayes said. The Public Safety and Security Committee has jurisdiction on all matters relating to the Department of Emergency Services and Public Protection, civil preparedness and homeland security, state police, the state-wide organized crime investigative task force, municipal police training, fire marshals, the fire safety code, the state building code, and legalized gambling. The Environment Committee focuses on matters relating to the Department of Energy and Environmental Protection that include conservation, recreation, pollution control, fisheries and game, state parks and forests, water resources and flood and erosion control; and all matters relating to the Department of Agriculture, including farming, dairy products and domestic animals. The Committee on Children shall have knowledge on all matters relating to children. Rep. Hayes can be reached via email at Rick.Hayes@housegop.ct.gov or by calling 800-842-1423. You can also follow his legislative activity by signing up at https://www.cthousegop.com/hayes/.